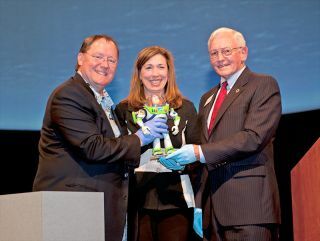 John Lasseter, chief creative officer at Pixar Animation Studios and creator of Buzz Lightyear; Lori Garver, NASA deputy administrator and National Air and Space Museum director Jack Dailey hold the space-flown Buzz Lightyear action figure. Buzz Lightyear has gone from being a fictional space ranger to a real space artifact. A 12-inch (30.48-centimeter) Buzz Lightyear toy that spent 15 months orbiting the Earth on the International Space Station was donated on Thursday (March 29) to the Smithsonian's National Air and Space Museum in Washington, D.C.
John Lasseter, the animator who created Buzz Lightyear and who is now the chief creative officer at Pixar and Walt Disney Animation Studios, handed the toy-turned-artifact to curators before an audience of museum visitors. "I am wearing blue gloves," Lasseter said, holding up his covered hands. "I don't have a problem, it's just that Buzz Lightyear is normally used to small sticky hands in life, but now that he's been in orbit and he's now a part of the Smithsonian, they have us wear gloves to play with him." Lasseter, who grew up admiring the Apollo astronauts as his heroes, so much so that he modeled Buzz Lightyear's appearance and named him after them, said that seeing the figure fly through space brought him "full circle." "Today is without question one of the greatest days of my life," Lasseter said. "I am so proud to have Buzz Lightyear be inducted into this, one of the greatest museums in the world." "We are pleased to welcome Buzz Lightyear into the National Collection; very soon space shuttle Discovery — his ride to space — will join him," Dailey said, referencing next month's delivery of NASA's most-flown spacecraft to the museum's Steven F. Udvar-Hazy Center. "We feel that Buzz Lightyear's popularity with young people will make him an important addition to our educational mission." Lasseter and NASA deputy administrator Lori Garver were present at the ceremony to certify that the Buzz Lightyear being donated was the one and the same as the figure that launched into space in May 2008 and returned to Earth 467 days later in August 2009. "As you know, every ounce is counted on the space station and Buzz went through incredible training to lose some weight," Lasseter joked. "We are told we will be able to tell the difference between this and any other Buzz Lightyear because he has — as most things are when they go to space — been modified," Margaret Weitekamp, the curator of the social and cultural dimensions of spaceflight, told collectSPACE.com in an interview. "The electronics have been stripped out of his insides. I understand that the battery pack has also been sealed shut, but without batteries. So, one of the other ways to know if he is the flown Buzz Lightyear or any other Buzz Lightyear action figure is if it works; if not, it's the flown Buzz Lightyear action figure." But before the action figure was made space-worthy, Buzz Lightyear was a child's play toy — literally. "Interestingly enough, the figure is the personal property of the Disney executive who was the head of putting this partnership together with NASA," Weitekamp said, adding that when it came time to find a Buzz Lightyear to fly in space, Disney couldn't find one. "Under pressure to produce the doll at short notice so that it could be delivered and sent into space for the mission, he went home and took his son James' doll and sent it off to NASA," she said. "I think it puts a very nice twist on the story — the figure that flew into space was actually a real child's toy." "So as a result, though we are working with Disney and Pixar on this donation, the deed of gift for the action figure itself will be signed personally, as an individual, by that executive giving us his son's toy. His son is now 14 and I guess has gotten over the fact that his dad took his Buzz Lightyear and sent it into space," Weitekamp said. The Lightyear figure will go on display later this summer in the National Air and Space Museum's "Moving Beyond Earth" gallery, which is devoted to the shuttle program and the International Space Station. "As a part of that [gallery], we have built a mockup of the crew compartment of the space shuttle, complete with the lockers where the astronauts stowed their clothes, their cameras, their food, the experiments and things like that. We're using those lockers as a display space," Weitekamp said. "So our visitors will be able to come in and open the door to one of the lockers and behind it they may find space food or they may find flown space clothing or they may find Buzz Lightyear." "Buzz has a locker that is reserved for him," she added. The mockup, which was recently installed, recreates the real orbiter that the National Air and Space Museum will display at its Virginia annex beginning in April. It also has a connection to the Lightyear figure. "It is a very nice coincidence that Buzz flew both to and from the International Space Station aboard Discovery and in fact, the mockup of the crew cabin that we have built happens to have Discovery's name on the side of it," said Weitekamp. "So we are hoping that Buzz will find himself quite at home going on display."